Doctor Ox and his assistant Ygene come to the small quiet community of Quiquendone located in Flanders. He promises to light this town with a network of oxyhydric gas pipes. During the construction of this network, the quiet community becomes quite excitable, to the point where they are ready to go to war against a neighboring community. But what is the cause of this change in the nature of the good people of Quiquendone? Perhaps it is something in the air, but only Doctor Ox and his assistant Ygene know for sure. As a clockmaker in Geneva, Switzerland begins dying, all of the time pieces that he has crafted begin failing as though a part of his soul became a part of each of them. Soon only one of his time pieces remains functional, and for the clockmaker to gain possession of it, he must give his daughter’s hand in marriage to a man who works for the devil himself. NOTE: This was originally written in 1854. In Germany a man plans to take some passengers on a ride in his balloon. When they don’t show, another man quickly jumps into the basket as the balloon begins its ascent. The unexpected passenger only intent in his ride it for the pilot to take the balloon as high as it will go. NOTE: This was originally written in 1851. When his son Louis and members of the crew of the ship Jeune-Hardie do not return from sea, Jean Cornbutte decides to refit the ship and go north to find them. Accompanying him on this trip is his son’s fiancée, Marie, and the man who would be his son’s rival for her affections, the ship’s first officer, André Vasling. When the missing party is found in the extreme north, the only thing left to do is survive the bitter cold and rivalry. NOTE: This was originally written in 1855. Quarantième ascension française du Mont-Blanc "The 40th Ascension of Mount Blanc"
Jules’ brother Paul writes about his climb up Mont-Blanc. Translator: Andrew Brown. Foreword: Gilbert Adair. London, Hesperus Press Ltd., 2003. 112 pages, ? ill.
Mad scientists seem to begin as a theme in old science fiction films, but the roots go much deeper. Certainly Frankenstein is one of the first examples of a researcher run amok and other writers have investigated this subject. 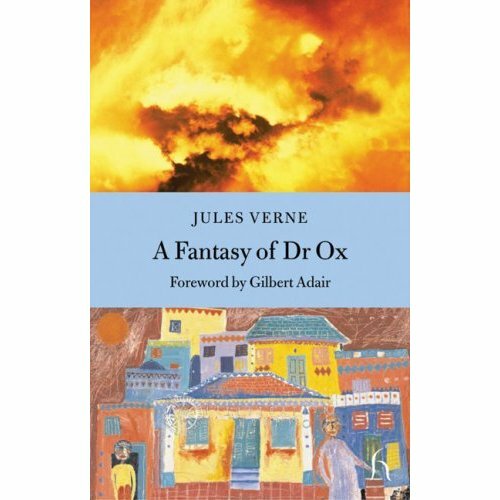 You may be unaware that Jules Verne wrote one such piece in A Fantasy of Dr Ox, a satirical work that looks at scientific ethics with a mix of warning and humor. The town of Quiquendone is the most Flemish of towns in Flanders because there “nothing was ever done quickly.” The natives of this burg are sleepy to the point of ridiculousness: plays take days to perform, decisions happen only after years and the average heart rate of the citizens rarely rises above 50 beats per minute. After centuries of a staid, lethargic existence, Quiquendone is facing some changes. A philanthropist, Dr Ox, is installing a new lighting system in the town, which will be the first town in Flanders lit by oxyhydric gas. The town councilor and burgomaster are unsure of this project, as it happened in unseemly haste, but since Dr Ox is paying all the costs, they are loath to stop the work. In the middle of a discussion on this topic, shocking news arrives: two of the citizens were planning to duel each other over … politics! Violence is rare in the town, but voicing one’s opinion on such an subject is even rarer. Thus begins a wild ride for the previously quiet community. As we quickly learn, the reason behind this transformation is an experiment by Dr Ox and his assistant, Ygène. The supposedly beneficial lighting system is actually to test Dr Ox’s theory on the nature of oxyhydric gas on people. When exposed, normally calm and placid persons become energetic, irascible and highly emotional. And what better group to try this out on than the most reticent of souls, the Quiquendonians? With his lighting system in every building, Dr Ox now can control how much gas is received by the entire population. I can just hear the evil laughter! While gas lighting is a bit dated, the story and characters are familiar. Dr Ox comes across as arrogant and uncaring, but sane. He does not see the townsfolk as people, but on the level with lab rats. His assistant is a bit more humane, questioning the experiment at one point, but never having the strength to stand up to his boss. There is definitely a message against unethical science in this story and while the Quiquendonians are dupes, they are also the most sympathetic characters in the story. The community is a bit of a parody, but a lively and interesting one. The effect of the gas is dramatic, turning the methodical and sober citizens into unpredictable maniacs, ready to attack a neighboring town for a centuries old trespass by a cow! Verne stories rarely are thought of with humor, but this is an oversight. There are plenty of giggles and laughs in this story, from the comical townsmen, the way they react to the gas and even from Dr Ox and Ygène. Verne shows a bit of Dickens qualities in his names, as the main characters’ names make up the word oxygen (Ox-Ygène). For scholars of Verne, this is no surprise, as the author worked on theatrical farces before his rise as a writer and Verne certainly shows he mastered the comic form. I appreciated the foreword by Gilbert Adair and introduction by Andrew Brown, both of which gave me more background on the story and Verne. A Fantasy of Dr Ox displays another side of this master writer, one with a bit more comedy. If you like your science fiction with a bit of whimsy, this is a story for you. -- Review by Colleen R. Cahill, originally published in Extraordinary Voyages, Vol. 11, No. 1 (Sep 2004).